I’m not usually one for tactics games because I consider myself a simple (read: dense) man, and so the term ‘tactical’ doesn’t really pique my interest that often. But Wartile also has the word ‘war’ in the title’, so I guess I had to check it out. For the record, Wartile bills itself is a tactical game based around cool-downs, in which you guide a bunch of Vikings. The story is pretty straightforward for the most part. Wartile puts you in the shoes of a villager (wielding an ax and a shield) who decides to go on an adventure … The reason is not 100% clear to me, as the game prefers to keep things a little cryptic. Maybe it’s a divine prophecy, maybe he wanted adventure, maybe he just hates his village; long story short, the reason is something we do not know, but it does not matter. You take your boat (no, no, it’s not a longship) and you sail to a small island. You find a chest (filled with gold and objects), opponents (that you kill without difficulty – as you are directly in auto-attack mode and against which you can use your special skill) and a goat that you decide to sacrifice to Eir. You engage another warrior (you have the choice between one with a spear and one with an ax and a shield), you distribute the items brought back from the first mission and you leave for a new adventure. Movement depends on the number of movement points your warrior has. The ground is cut into hexagons. You move your character, wait a few seconds for the bar to recharge, and you can move it back. The enemies are smart. When they see you, they darken, finally, they move towards you to attack you. The good idea, since there is no time limit, is to position yourself in height (and yes, bonus attack and defense when your character is in height) and wait for the opponent s ‘approach. You can then massacre him. Both attack and defense are automatic, you have nothing to do except move your character or use his talents (in the form of cards).The same thing for chests, you do not have to pick them, you get everything automatically. However, you can only equip yourself in the village. Wartile is without a doubt an excellent independent game. I love this style of play and I took a lot of fun to find out. I look forward to seeing his final version with more warriors and more adventures. I hope there will also be more talent and more objects. 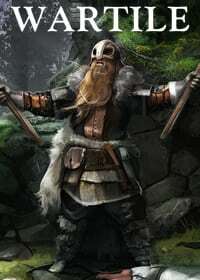 If you are a fan of tactical games, if you (positively) root for the Vikings, if an early access (but playable) does not discourage you, if you like when a game is superbly done, then look for your wallet. The game, Wartile, is waiting for you in the Steam store, buying it is a good thing for you but also for the studio, have fun! Wartiles was reviewed using a PC downloadable code of the game provided by Deck 13 Interactive. The review was tested on a PC running Windows 10, with an 8GB NVIDIA Geforce GTX 1070 fitted on a 4th Generation Intel i7 4790 3.6Ghz CPU and topped with 16GB of RAM. We don’t discuss review scores with publishers or developers prior to the review being published. Wartile takes on the familiar Viking setting and mixes it with classic tabletop and strategy mechanics. It’s got an intuitive system that doesn’t get complicated over time, and a solid loot setup. Even if you’re not a big fan of tactical games, Wartile is worth a spin.